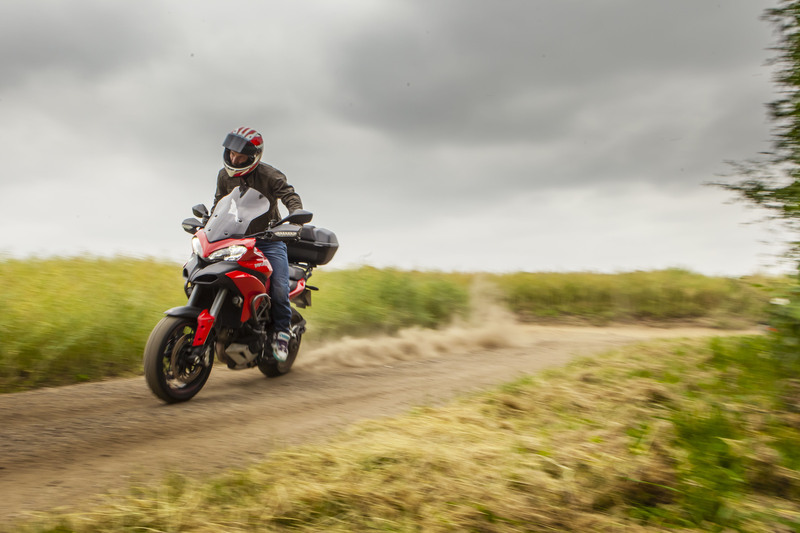 Is a Ducati Multistrada Granturismo really an off road bike? The big GT definitely plays the adventure bike card, but is it actually any good in the dirt? Well I’m writing this as I’m about to go and find out what it’s like off-piste. Yes, I am a little nervous. On paper it’s hard to believe it would be happier anywhere other than tarmac – it’s a 150bhp V-Twin that weighs in at 245kg for god’s sake. As if that wasn’t enough, it’s on piddly little (by off road standards) 17” wheels with wide sports tyres on. Now I know the Michelin PR4s I’ve been running are a bit special when it comes to a wet road, but no amount of special sipe technology is going to help out in an inch of mud. But the Ducati does have a few things going for it when the tarmac runs out. Big wide handlebars are always a bonus, giving you some leverage to stick it where you want it and pull it back in to line when things get squirrely. Yeesh, even writing about getting out of shape on a seventeen thousand pound bike on gravel makes me nervous. The riding position does give you a chance to stand up comfortably too. There’s some clever stuff going on with the electronics as well, that aims to make forays into the dust a little easier. First up the suspension. There’s a good amount of travel available, enough ride height to cope with potholes and small logs (really small ones, more akin to big sticks) and the electronic damping system has a setting suited to off road. The default setting for traction control and ABS in Enduro mode is supposed to allow enough slip to work on gravel, without firing you to the moon as soon as you touch a control. And finally, the engine power is dropped to 100hp in enduro mode, so there’s less to fight with when the grip is low. You can customize it and crank the power back up if you want, but a frontal lobotomy is probably less messy and better all round in the long run. Right, enough procrastinating, I’m off out now to see how a 180-section PR4 Michelin copes with gravel, mud and 240kg, wish me luck. Sadly, no ploughing attachments are currently available for the Multi. OK, I’m back and pleased to report zero casualties or deaths. The bold red flanks of the 1200s remain scratch-free, the seat unsoiled and the levers all intact. The Ducati has never claimed to be an overgrown enduro bike, ready to smash through ruts, bogs trees and anything that gets it its way. It definitely sits at the ‘capable of tackling bumpy gravel tracks and some mild off road sections’ end of the adventure bike spectrum. With this in mind, I steered clear of flooded, rutty lanes, opting to enjoy blasting down loose gravel tracks and through the occasional hard-packed dirt cut-through. The 100hp power setting is a godsend, delivering linear, predictable power to give the rear tyre a fighting chance. The traction control and ABS do a good job of keeping things under control too, stopping the rear stepping out when I gassed out of turns and saving me from locking the front when I’d added too much speed for the massive pothole I was approaching. In the interests of science, I turned the ABS and TC off, allowing the bike to slide around and make me feel like a hero. A hero with a nervous look of ‘I can’t afford to fix this’ on his face admittedly. The small wheels don’t exactly eat up bumps, stones and potholes and the front tyre definitely felt pretty nervous on larger loose rocks. But, it did what it was supposed to do – it allowed me to adventure. Yes I’ve taken sports bikes down those same lanes, but unlike them, the Multi loved playing around in the gravel and felt in its element. As soon as the surface got wet or too loose, I had to reign the speeds in, where a more dirt-focussed adventure bike would have carried on regardless. But they wouldn’t be able to keep tabs on the Ducati around a track. So for the more tarmac oriented adventure bike aficionado, the Multi is perfect – it can go off road, even if it’s not the most natural there. It adds another opportunity to enjoy the bike and more chances to do big skids. Yes it’s nerve wracking on such a shiny, expensive bike but hey, what are crash bars for?